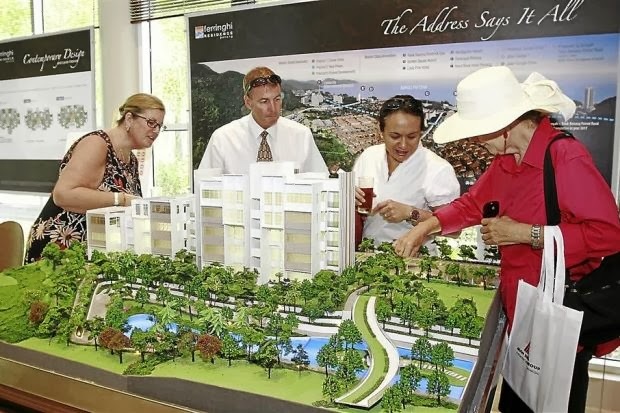 One of Mah Sing Group Berhad’s latest projects, the Ferringhi Residence in Batu Ferringhi, Penang, is enjoying brisk sales. About 70% of the units have been sold since the project was launched early this year. The units sold were under Precinct 1 (condo villas), one of the three precincts in the 27.4ha freehold residential enclave. Precinct 1, which is set to be completed in the next three years, is already 20% completed. Consisting of 200 units spread over a spacious 4ha site, it is a low-density residence. There will be 20 five-storey blocks with only two units per floor and three types of layout per block. Mah Sing chief operating officer for high-end residential projects Teh Heng Chong said their projects including Ferringhi Residence were different from other housing projects as they were all developed with different concepts. “We have a 27.4ha site and it is a great opportunity for us to do something unique,” said Teh. Teh was speaking to reporters after launching the show village of the project on Saturday. “We wanted the homeowners to feel like they are staying in a resort,” he said. Also present were the group’s chief operating officer Adam Leow and northern region general manager Woo Kok Weng. Leow believed the project could further enhance the tourism industry of the area as it blended well with the natural environment and lively neighbourhood. During the launch, visitors were treated to stage performances, a street dance, a lion dance and a special appearance by 8TV host Baki Zainal.